Rapidly establishing itself as a free source of energy, Solar heating is increasingly being installed in the local area. Buxton Heating are fully trained and qualified in the installation and maintenance of Solar Systems and Solar Panels. These systems are designed to work with existing heating systems that use a cylinder to store hot water. It is financially sustainable because using renewable energy sources protects you against increasing energy prices. 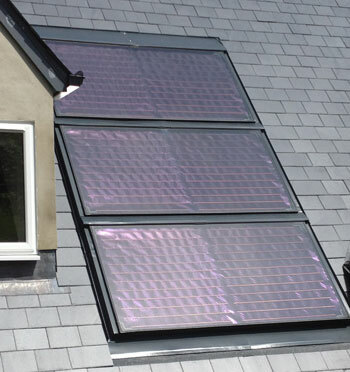 We install solar panels that utilise the power of both direct and diffused sunlight. This energy is converted into heat that produces hot water for your home, which can be stored in a hot water cylinder or a thermal heat store. Buxton Heating can advise you and specify a system to suit your home which should provide 50 – 70 % of your hot water requirements.